Being told your child has a condition that can only be rectified through physiotherapy and surgery is quite a lot to take in when you are lay on a bed looking at the little bean in your tummy. It casts a shadow over pregnancy, and you know you have to appear positive and tell everyone that it is going to be okay, but in the back of your mind there is a little thought “what if my baby isn’t going to be okay?” Of course, you can’t really tell people that you are thinking that at the risk of being a Negative Nancy – which is not me at all – and you trick yourself out of if occasionally, but it always comes back. Milo was born by emergency Caesarean section and I immediately asked what his feet looked like. The surgeon asked why I was picking faults with my child, and although I was high on life, happy as Larry, it was my main concern and I managed to tell the surgeon that my child has got bilateral talipes and I wanted to see how severe it was, immediately! 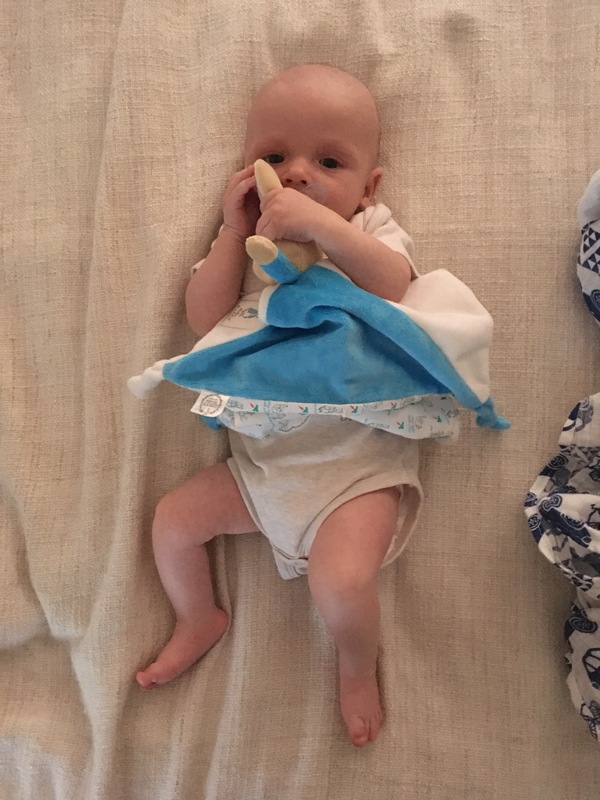 After checking his feet and breathing a sigh of relief that nothing else had been picked up in any of the newborn checks, I started preparing myself for what would be the next step. This is how I deal with life with Milo. I knew step one was for Milo to be treated using the Ponseti Method of casting. I just didn’t get told how long they would leave it or how long this treatment would take until we turned up to our first appointment. 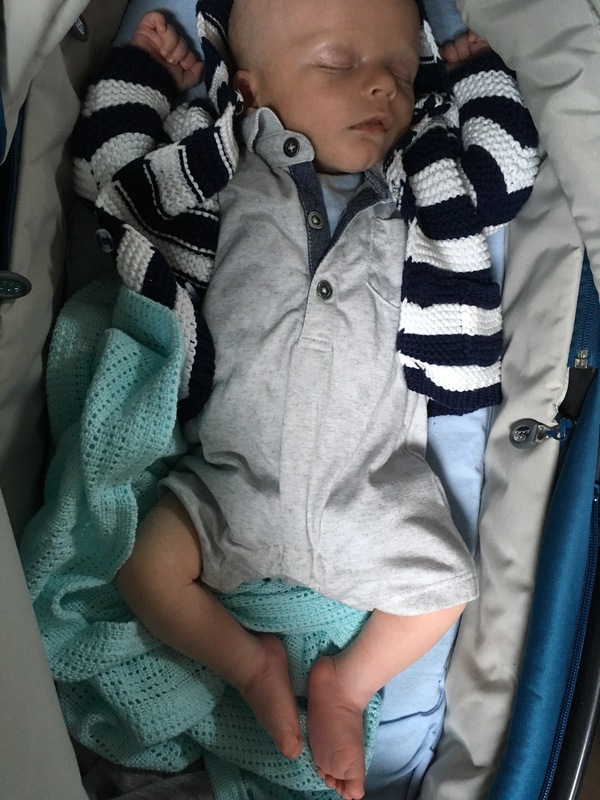 We turned up to the Physiotherapy Department at BCH unaware that Milo at two weeks old, would be casted up right then and we wouldn’t have his little prawn shaped cuddles anymore. So whilst a little warning would have been appreciated, with the treatment we have recieved for Milo, it really isn’t worth dwelling over. As a family, we have all been looked after. Our physiotherapist is fantastic! The first session we had, started with a consultation telling us all about the purpose of the casts, how they are manipulating the feet outwards slightly by having new casts every week and how we keep them clean and dry. We had a lot of questions and every single one was answered efficiently and with honesty. After the first week of Milo’s new legs, we had come to realise that looking after him was just the same as before but with just a few minor things to be aware of. No baths. With Milo so small, he wasn’t really going to get dirty but it was surprising how much dirt accumulated in fingernails and between toes so it was very important to sponge bath Milo every night. The positives outweigh the negatives here though. Milo’s skin wasn’t dried out by baby bath, we kept on top of his hygiene through the day so bathing him before bed was never a chore and we were religious with this cleansing routine so Milo quickly learnt the difference between night and day (not that this stopped him waking to feed hourly, he just knew it was time to go straight back to sleep). Poo on casts is inevitable, we just learnt to be laid back about it and scrub vigorously with a wet wipe. By day six of the casts, there were so many marks on them that it really didn’t make any difference where they came from. Baby poo doesn’t smell though, so there isn’t anything to worry about! The only thing to be wary of was getting urine on them as it’s so acidic it will burn through the plaster casts and hurt the skin. The physio department are so accommodating though, we could just soak the casts off and get new ones if that did happen. Milo would often get sore patches from his casts, this is common! The top of the thighs, back of his knees and his toes would look red and skin would seem quite damaged in these areas but healing time would be a few hours after using a barrier cream, so there are no long term sores! 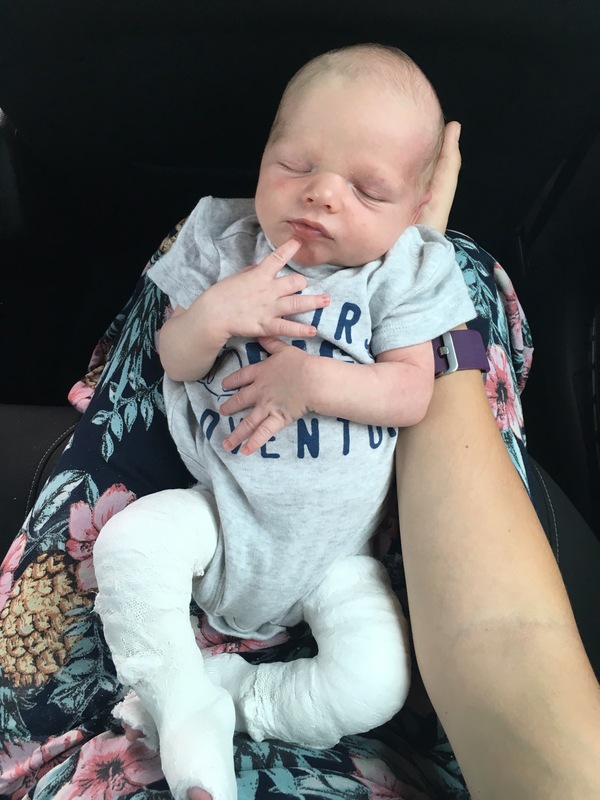 Milo was never in newborn or 0-3 months trousers or dungarees because the plaster casts would make the size of his legs double! The positive here is that he’s been in 3-6 months trousers from birth and now that he has no casts, this size still fits, almost 4 months on. Finally, soaking the casts off takes hours to start with. It does get quicker, but it’s not pleasant having a newborn baby sit in the bath for about an hour whilst tugging at his legs. Luckily, Milo is breastfed so I used to wait until he was due a feed and do it sat in the bath with him. It took his mind off the uncomfortable feeling of having wet, heavy casts and time used to pass quite quickly. By the time he had finished feeding, his casts were soft enough to just unravel. With Milo having plaster casts on for 13 weeks of his life, we got used to the weekly bath routine and travelling two hours to the children’s hospital (a trip that should only take an hour, but never did) we soon got used to this extra care that our little one needed and it fitted into our busy lives with little disruption. Milo became aware of the things he could do with these special little legs. The noises he could make to get our attention and his ab workouts were our favourites! He would lift his legs as high as he could and kick them down again, making everyone aware that he was awake or wanted a chat. It was also reassuring on long car journeys when we would hear his legs knocking together! Over the 10 weeks of Ponseti casting, we noticed a huge difference in Milo’s feet. Here are a few progress photos after treatment. Milo’s feet at birth. Turned in and up. First casts at two weeks old and a slight manipulation at the ankle. Progress after three weeks of casts. Milo’s feet still had a long way to go here but treatment was working well. You can see they aren’t completely turned in anymore and the feet are straight. Here is Milo after his Ponseti treatment! Only a slight turn in his feet and ready for operating! Milo’s operation is to snip his tendons and position his feet correctly, the procedure is called a tenotomy. It’s been a bit of an emotional rollercoaster at times, read all about it in my next blog!